One thing I noticed. It does not matter whether we are the best of worst in the NHL we keep shooting at posts. How many we had this game? Two already? Let's go Red Wings! We once again going to have a s***ty team and I'm so bored without hockey! Exactly my thoughts. But people here are too busy screaming that we at least got 4th round pick for someone who is going to leave anyway forrgetting what is the actual reasons for this mess. I'm 9yo doing my English homework here. The problem with Holland is that he has no ideas what he is doing. If Mrazek wasn't the goalie of his choice he should have traded him 2 years ago. Instead, he created a toxic conditions for him last year exposing him to expansion draft and openly trying to trade him. Now, the net result is no return for a goalie that still has much better potential than anyone we have in our pipeline. We basically need a goalie right now as Howard is going to play even worse having virtually no competition. Well, 4th round selection is nothing. Of course, Holland had no intentions qualifying him. That is called bad asset management. Another glory day for the brand new Red Wings! First treating Mrazek like s*** by exposing him to the waivers and then trading him for nothing while also retaining salary... And all these having no goalies in the pipeline. Well done!!! For the Flyers it has all the potential to be "reserve" Bob trade. So far, Howard is playing the best hockey of his career. I personally didn't even think he could be that good. Tried to find highlights on nhl.com but it seems those are unavailable for preseason games. Is this true? I have a feeling we'll sign one or both... Athanasiou will play in Russia while Svechnikov and Bertuzzin in GR. It is becoming more and more frustrating. 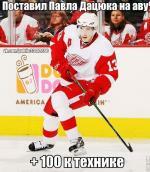 I voted Datsyuk simply for how Red Wings started to look like once he departed. However, it is as close as one gets.